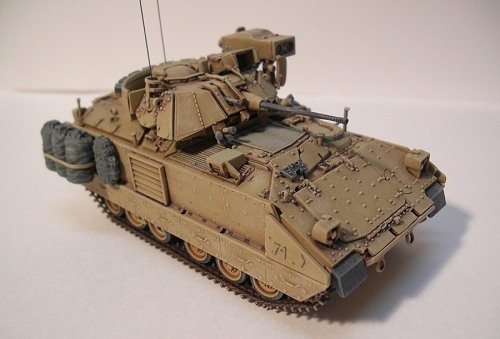 After a long development period, production approval was granted for the Bradley Infantry Fighting vehicle in January of 1980. 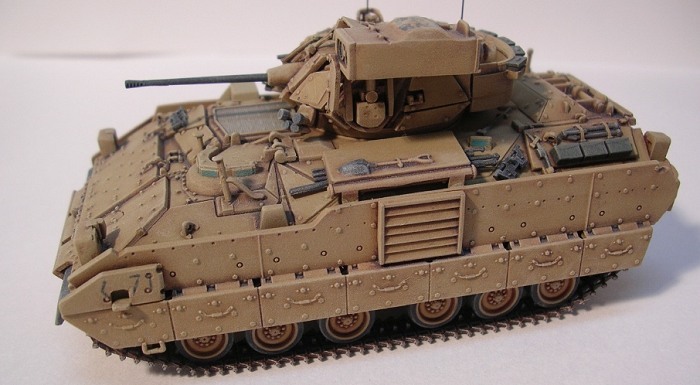 In a departure from the vehicle it was designed to replace the M113, the Bradley was not just an armored troop transport but a true fighting vehicle. 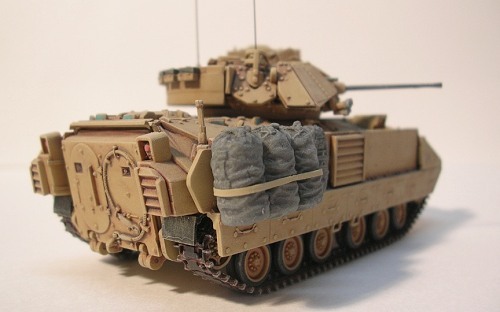 In February of 91 the Bradley saw it's first use in combat during operation Desert Storm. The Bradley's performance in the lopsided victory over Saddam's Iraqi military was quite impressive but not without a few short comings. Reliability was excellent as was the effectiveness of It's weapon systems with the exception of It's 7.62mm co-axle machine gun which was prone to jamming. The 25mm main gun proved very effective and on a few occasions was even able to knock out Iraq's older tanks(T-55's & Chinese type 59's) with depleted uranium rounds. The twin TOW missile launcher was also very effective though some crews complained of it's slow raise to the firing position. Of the 20 Bradley's lost during Desert Storm, 17 were due to "friendly fire" with only 3 destroyed due to enemy action. Identification panels have been added to current Bradley's to help reduce this problem. Bradley's again returned to Iraq during Operation Iraqi Freedom and helped lead the way to Baghdad and the final defeat of Saddam's Army. A recent issue of FineScale Modeler contained a readers poll in which this kit won first place in the non l/35th scale armor category. Open the box and shuffle through it's contents and you will quickly see why. The two sprues of soft vinyl and 3 sprues of dragons typical gray plastic are beautifully molded with virtually no flash. A tiny decal sheet is also included with markings representing a vehicle used in Operation Iraqi Freedom. This was also my first small scale Dragon Kit without the die-cast metal hull. The 8 step instructions are well printed but a bit tricky (more on this later) and include a nice color photo of the actual vehicle that comes in handy as a reference. The box art is also of this same photo. Pleased with the contents of the box it was time to throw this little baby on the bench, and roll up my sleeves and get to work. First off before we even get started with cutting parts and flinging tenax let me highly stress to study the directions CAREFULLY. Many small parts are illustrated already installed with just a part number by them. I found no major error's in the directions but you really need to study them so you don't miss anything. Step 1: Assembly of the drive wheels, return rollers, and road wheels. Tiny pollycaps are included to ease painting later on and fit of all these parts was excellent. Be careful during assembly and when done store these carefully as no extra's are included and the Carpet Monster just love's these little things! For some reason if Dragon included a dozen extra's he wouldn't seem to like them as much. Step 2: Is the lower hull assembly and is pretty straight forward. The hinges for the loading ramp are a bit "fiddly" but everything fits reasonably well. I elected to leave off all the wheels until after painting. Steps 3 & 4: Are the turret assembly. Pay close attention here as many of the armor plates are shown already in place, look for the part numbers carefully and it all goes together fine. I did sand down the antenna bases and drilled them out to add fine wire to these later. The TOW missile launcher can be installed in the lowered or raised (firing) position. I elected the later and fit was excellent although the two pieces in the rear (parts C6) are very small and a bit difficult for an ox like me. Take care with the smoke grenade launchers. If you just put them on like it looks like they should fit they will point straight forward. Found this out the hard way but was able to angle them up okay before the glue fully cured. With the turret complete in my hand I turned it over to examine the bottom and here I came across my first problem. The lower turret (Piece C27) is totally missing a section in the lower right hand front leaving a fairly large "hole" in the bottom. I re-read the directions a few times to find the "missing" part but there isn't one. If I would have caught this prior to having it assembled it could probably be fixed relatively easy with some sheet stock but with the angles now it would be difficult. Finally I decided to fill it with 2-part epoxy putty which I then smoothed out with a small putty knife and water. It came out fairly well and after painting was hardly noticeable. Step 5: Is the mantlet and main gun assembly. No problems here although I did leave off the gun barrel until after painting and weathering so I didn't break it off. Step 6: Is the upper hull. Keep an eye out here again as some parts are easy to miss. I substituted some copper wire for part (C39), carpet monster got it and I didn't even attempt to crawl around on the floor looking for the tiny grab handle. Took less time to make a new one and it really looked better to boot. Here also I ran into problem #2, the headlight/guard assembly's fit poorly. Careful filing and dry fitting will cure this and after a little time and elbow grease they went on fine. Step 7: Is attaching the upper hull to the lower hull. Fit is excellent and you don't have to worry about the long seams down the side as the armor side skirts cover these completely. Step 8: Is the armored side skirts and a small antenna. Be careful drilling out the holes on the side skirts for the IFF panels. Be sure and drill the right ones. I assembled these but left them off until after painting was completed. 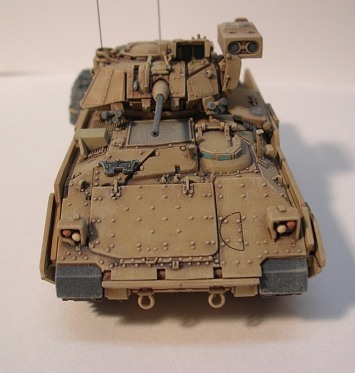 I airbrushed the completed hull, turret, side skirts and wheel with model master acrylic Gulf War Sand. I then took the road wheels and using masking tape stuck them to a sheet of cardboard and sprayed them flat black on the back and sides. This left me to only go around the rims with a fine point sharpie and touch them up with a brush and some flat black. Next I got ready to do all the little detail items. Tow cables, tools, head and tail lights. For these I use a very fine point brush or toothpick and enamel paints. Acrylics tend to dry to fast and clump up making brush painting these items difficult. A good lighted magnifier is also very helpful. I finished the soft vinyl 1 pc tracks by simply giving them a healthy wash of rustall and then dry brushing them with Tamiya acrylic titanium sliver. They were already black so I didn't see the need to paint them first. After the silver dry brushing I did go back over the track pads with a dry brushing of flat black. I highly recommend using only acrylics paints on dragons soft vinyl parts and tracks. Some enamels seem to re-act to it and not dry properly as I was about to find out the hard way. The kit also contains a sprue of soft vinyl stowage items. I wanted to put a few on but not all as I just didn't want to cover up some of the kits really nice detail. I brush painted some duffle bags and a back pack with MM olive drab enamel. Big mistake as two days later it was still extremely sticky. I ended up removing this paint with an old brush and Testors brush cleaner. I let them dry out for a day then drilled a small hole in the back of each for a tooth pick to hold them and airbrush MM acrylic olive drab. This worked much better and they then got a dry brushing of faded olive drab and gray. I painted the extra track links flat black on the spure and when dry removed them and dry brushed with steel. I carefully removed the 25mm gun barrel from the sprue and was going to drill it out and brush paint it flat black but here I had a problem and it was all my fault. The newer Bradley's have a fluted barrel, this creates more surface area for the barrel and helps it cool more efficiently. For me it also made for a very delicate piece and I muffed it big time trying to drill it out and bent it causing an ugly flex cracked area. I would like to blame this on Dragon somewhat soft plastic but hey I flat messed it up. Lucky for me the kit also contains a non-fluted somewhat thicker barrel which I ended up drilling out and using. It isn't really correct for this model Bradley but most folks will never notice. Well and If all you guys don't rat me out as well!! Next up I shot a coat of future on the turret, hull, wheels, and side skirts to prepare them for decals and an oil based wash. The decals went on fine and I used a little solvent to settle them down. At this time I also cut some small strips of a decal from the spares box using a metal straight edge and a new sharp razor blade. I cut these into little pieces for the vision ports. The first one I put on rolled up into a tiny white tube the minute I put some micro-set to it so I removed it and used future with a fine tip brush from then on with good results. It may have been a bit more tedious but I think it came out better than trying to paint them. After the decals had set and dried (24 to 48 hours) I applied a oil wash using burnt umber tube oil paints thinned with turpinoid. The coat of future helps this flow into all the nooks and crannies plus it protects the underlying paint. After this has dried for several hours I remove the excess wash with Q-tips lightly dipped in fresh clean turpenoid. Be careful when doing this not to rub to hard and damage the base coat of paint or break off any small fragile parts. Next I shot everything with MM acrylic flat. I like to dry-brush on a flat, non-glossy surface. 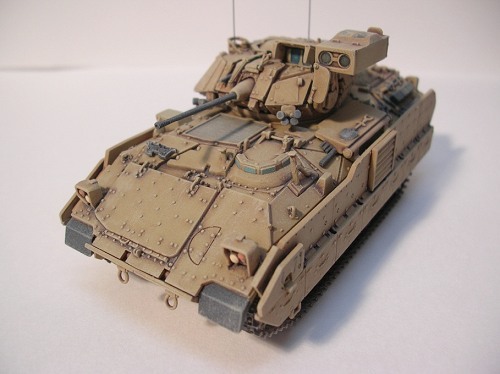 I used a lightened mixture of the base Gulf war Sand for most of the vehicle with some steel and gray for some of the finer details. I started final assembly with the wheels and tracks. The poly caps work great here as you just pop each wheel on it's axle. Previous l/72nd scale Dragon Kits I've done their tracks have all been a little on the snug side. 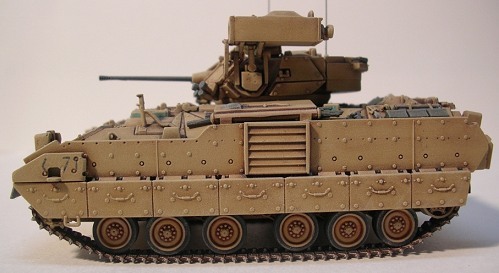 The ones for this Bradley fit absolutely perfect with just a tiny bit of stretch needed to engage all the teeth of the drive wheels into the tracks properly. The side skirts went on next and fit very well. Each side has two posts that fit into corresponding holes in the hull. A drop of CA on the posts secured them nicely. Next up was the main gun barrel, spare track links and stowage items. Last up was the tiny metal wire I had painted black for the antenna. I usually always save these for last, as it seems if I don't I always bend or break one. With assembly now complete I gave it a couple of light coats of pollyscale dust thinned about 50/50 with MM acrylic thinner and one final coat of MM acrylic flat to seal everything up. Well I had allot of fun doing this great little kit. I had a few problems, most of which were of my own doing but I was pleased with the results. 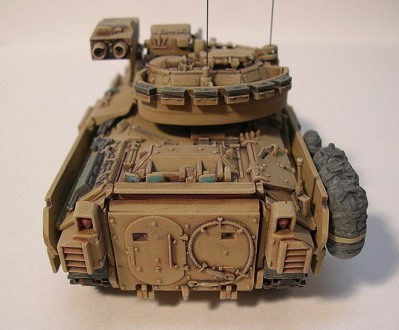 If not for the big "hole" on the underside of the turret this kit would be near perfect. The fit of the headlight/guard assemblies was easily fixed with a little sanding and test fitting. overall I highly recommend this kit and I sure hope Dragon keeps these little l/72nd scale armor kits coming!